6 October/November 2018 unmanned systems inside Could the Regulatory Bottleneck be Solved by the Private Sector? EDITORIAL OPINION Photos courtesy of Impossible Aerospace, Nuro and FlyCam UAV. 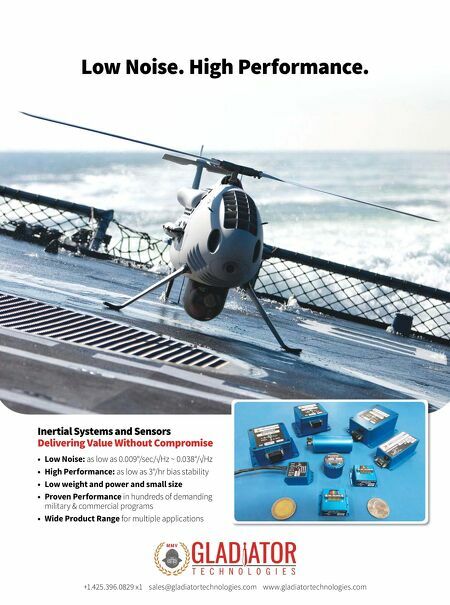 A s the stories in this issue make clear, there is enormous research activity underway across the unmanned sector. That independently supported research may be the answer to both the unmanned industry's key technical challenges and its show-stopping regulatory problems. Firms are addressing operational problems, finding ways to quadruple f light times by inte- grating batteries into their rotorcraft's structure and radically extend inspection and monitor- ing missions with solar powered, helium-based airships. These f loating motherships could also someday carry smaller drones (page 44). New research into bladeless designs could make operating drones safer (page 37) while other ef- forts could hammer out the kinks in long-hoped for applications including package delivery using driverless vehicles (page 14). There are algorithms in development that could make manned f lights safer by protecting them from bird strikes (page 40) and new combinations of sensors and aircraft that enable safer assessment of radiological risk after a nuclear accident (page 64). Some private research centers on efforts to foster startups. The Genius NY program, (page 57) which is about to enter its third year, helped launch six firms in 2018. These companies are using drones to give first responders a better view of accidents, count parking spaces, predict the weather for drone operators, rapidly process aerial images, manage drone fleets and pollinate fields short on bees. Pollination is just one application being envi- sioned for farmers, as our story on Agriculture and Space Day in Brussels makes clear (page 51). 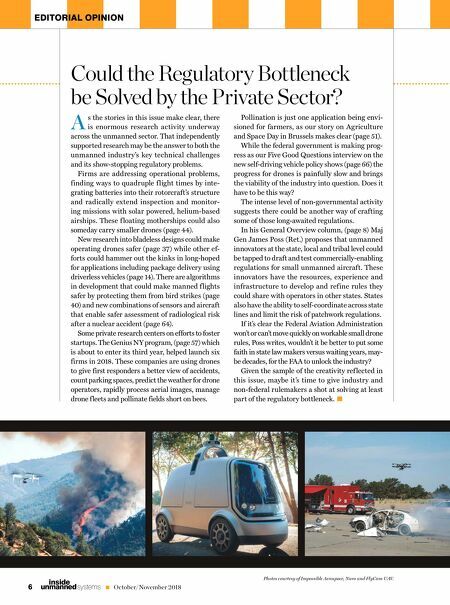 While the federal government is making prog- ress as our Five Good Questions interview on the new self-driving vehicle policy shows (page 66) the progress for drones is painfully slow and brings the viability of the industry into question. Does it have to be this way? The intense level of non-governmental activity suggests there could be another way of crafting some of those long-awaited regulations. In his General Overview column, (page 8) Maj Gen James Poss (Ret.) proposes that unmanned innovators at the state, local and tribal level could be tapped to draft and test commercially-enabling regulations for small unmanned aircraft. These innovators have the resources, experience and infrastructure to develop and refine rules they could share with operators in other states. States also have the ability to self-coordinate across state lines and limit the risk of patchwork regulations. If it's clear the Federal Aviation Administration won't or can't move quickly on workable small drone rules, Poss writes, wouldn't it be better to put some faith in state law makers versus waiting years, may- be decades, for the FAA to unlock the industry? Given the sample of the creativity ref lected in this issue, maybe it's time to give industry and non-federal rulemakers a shot at solving at least part of the regulatory bottleneck.